Sam Wood (Huff) is a Vietnam War vet who is still chillin’ in ‘Nam because he “feels more free there”. When a female reporter named Maryline (not a typo) Kane (Stavin) approaches him about being in a news package about returning to Vietnam, he reluctantly accepts. It soon transpires that the whole thing about being on TV was just a ruse to get Wood to go back behind enemy lines to rescue Maryline’s father, who is still a prisoner of war at the Lu Tan prison camp. She sought him out because he’s a one-man army with a surprisingly positive attitude. His motto of “It can be done!” is downright infectious. But rescuing dear old dad isn’t going to be a walk in the Philippine park. He has to contend with super-evil arch-baddie Duan Loc (Pochath), his toady Bross (Puppo), and a never-ending stream of tan-outfitted, triangular-hat-wearing troops...who bring new meaning to the term ‘cannon fodder’! Will Sam and Maryline be the new Sam and Diane? Or will he prove once and for all that he is BORN TO FIGHT? Man, Bruno Mattei was sure on a roll in the late ‘80s. 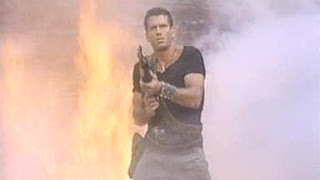 To think that this one man, in this one short span of time, turned loose on the world Strike Commando (1987), Double Target (1987), Cop Game (1988), Robowar (1988), Strike Commando 2 (1988), and the movie up for discussion today, is just insane. Sure, he may have recycled a bit of footage here and there, but who’s counting exploding huts? And this is just ONE guy! Never mind all the many others churning out video store-era gems at the time. 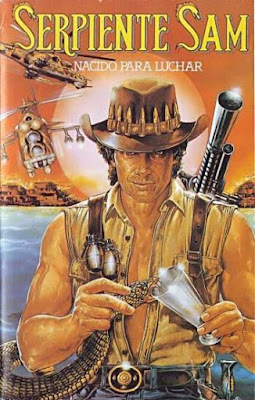 Yeah, this never came out on VHS in the U.S., but you get our point. Both Huff and Mary Stavin return from Strike Commando 2, and while there is some standard bickering between them, this is truly Huff at his best and coolest. As some sort of lost-in-translation-from-the-original-Italian cross between Indiana Jones and Sonny Crockett - when he’s not channeling Clint Eastwood with his low-slung cowboy hat and cigar stub - he drinks snake venom at a bar and massacres countless people with his machine guns and grenades. He has a lot of funny lines, mainly after he kills some baddies: “Shut up!”, “Shove it!”, “You started it!”, etc., though it could be forgiven if it seems like his dialogue was written by one of those push-button insult machines of the time. Still, this is the Huff you want, unlike The Bad Pack (1997), which was disappointing Huff. Werner Pochath is notable as the evil baddie named Duan Loc, who has an ‘Evil German’ accent. Helpfully, he cries, “Sam Wood isn’t like other people. He thinks he’s inWINCEable! He was born to fight!” It’s also handy to know there are massive battalions of Viet Cong soldiers still on the attack in 1989. The hotel assault scene is a movie highlight, as is the climax, with a mega-kill count and exploding huts galore. It’s amazing the jungles of the Philippines were able to survive after all that was blown up there. But it’s all for our entertainment, and even with the repeated footage (both dialogue scenes and blow-up scenes), it all adds up to a golden age of filmmaking never to be repeated. We should really treasure the output of this time and place. The soundtrack by Al Festa certainly won’t be confused for John Williams anytime soon, no matter how hard he tries. We certainly preferred the non-ripoff synthesizer themes. That’s what these movies are all about. Blow-ups, shooting, and the craziness in between. You gotta love it. God bless Bruno Mattei and all his hut-exploding ilk. The reverberations from the explosions that they created are still being felt today.